Native American Artisan made Dry Creek Turquoise Rings for Men and Women. 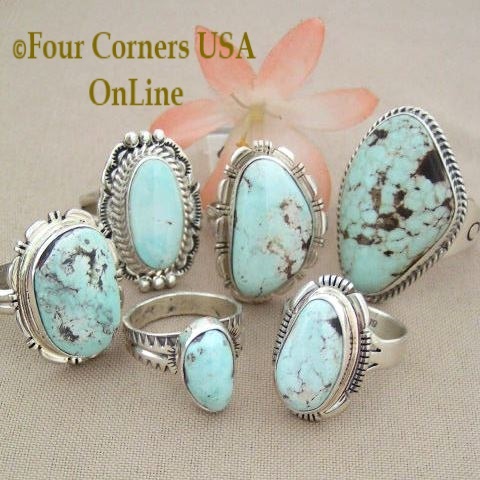 At Four Corners USA onLine Jewelry Store, we are proud to offer a wide variety of stone size, ring size and styles to fit your individual taste, style and budget. With limited mining and availability, we present one of the largest selections of quality Dry Creek Turquoise stone Rings set in Sterling Silver designed by seasoned Navajo Jewelry Makers. The exquisite paler softer hue of Dry Creek Turquoise is adored for its unique color and natural hardness yet still offering a variety of shades and matrix.